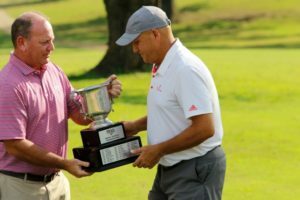 Wayne Fredrick, Springfield won his first Senior Amateur Championship at Westwood Hills Country Club, Poplar Bluff on September 17-18. His first round started with a bogey on 1 (par 4) and an eagle on 2 (par 5) a bogey on 3 and never looked back! He finished with 3 eagles, 5 birdies and 2 bogeys for a -9 62. The second round he seemed to struggle a bit but still finished with a round of 72 to win the event. 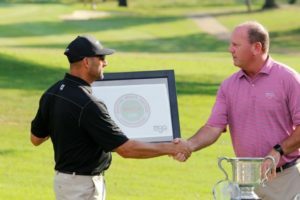 Fredrick has now won all the MGA stroke play majors; the Amateur in 1996, the Mid-Amateur in 2007, the Stroke in 2001, and also the Four ball in 2014 with partner Kory Bowman. 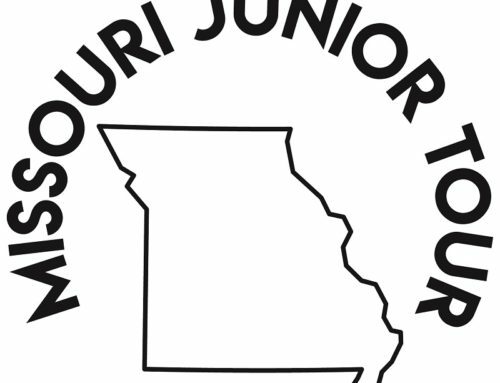 There were 3 players that tied for 2nd with a two round total of 140 (-2 under par) Bob Hanneken, Waynesville, Brian Haskell, St. Joseph and Tim Holmes, Springfield. The local boys Bobby Godwin 71/71 and John Shock 74/71 also had two great rounds. David Samp, Moberly competed in the Net Division. Samp won in a playoff against David Diemer, St. Louis 61/71 132 (8 CRS HI) to win the tournament 63/69 132 (16 CRS HI). Samp also loves to compete in all the MGA Senior Series Tour events and he and his son have played in the Parent Child for more than 10 years! Thank you David for your love of the game! 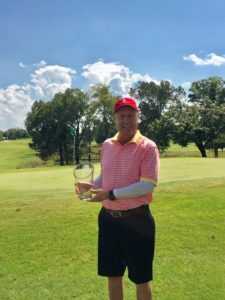 Denny Payne, Creve Coeur has won his first MGA stroke play event! Payne competed in the Super Senior division and won 72/75 in a playoff against Jim Beatson of Camdenton 73/74 147. 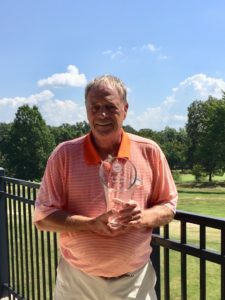 Congratulations to Alan Schuermann who shot his age for round 2 76/72 and finished tied for third with Ron Brewer of Leawood, Kansas 74/74 148. 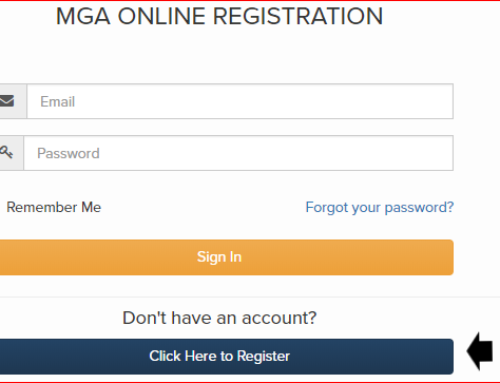 The MGA is so grateful that the members of Westwood Hills allowed us the opportunity to have an event at their facility and the opportunity to show-off their course. It was in excellent condition and the players enjoyed their experience very much. Thank you so much to Jimmy Vernon, PGA Professional (L) and all the staff at Westwood for all their assistance during the event and the support over the years.